Dutch Flower Auction Direct Blog - New! February Social Club Box! Today we are launching our Social Club Box for February! This months box is the absolute best of what Holland has to offer this season! Free UK next day delivery! Available to order now! Our Social Club Boxes are designed for you to arrange your own beautiful bouquet at home. 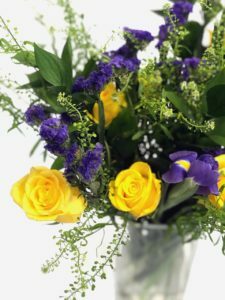 Priced at £30 you will receive between 20-30 stems of fresh flowers and foliage per box, specially selected by our designers. 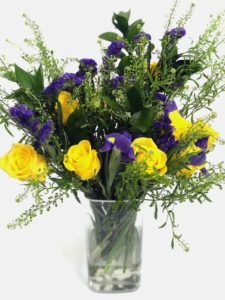 Your flowers will arrive carefully packaged straight to your doorstep, ready for you to work your magic and arrange at home. 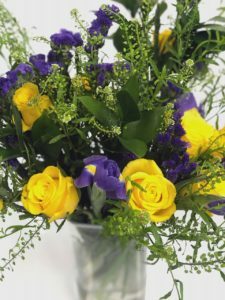 Our February Social Club Box contains - 10 stems of yellow roses, 5 stems of hard ruscus, 5 stems of iris, 5 stems of crystal dark blue statice and 5 stems of green thlaspi. 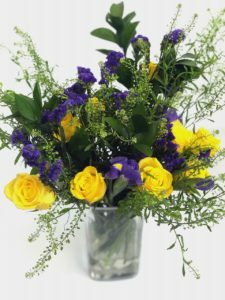 This months box is the perfect way to start to welcome Spring into your home with vibrant yellow and purple! The thlaspi gives the bouquet a fantastic foraged wildflower feel! We love to see your bouquets arranged in the home! Don't forget to send us your photos! Contact us at info@dutchflowerauctiondirect.com or visit our social media pages.